In the late morning of May 29th 1953, the sun was shining brightly on the roof of the world, a gentle breeze was blowing and two men were there to witness it for the first time ever . Their names were Edmund Hillary and Tenzing Norgay and the roof of the world was Everest. With a beautiful foreword by the greatest living explorer of our time, Sir Ranulph Fiennes, this brilliant book combines fresh and contemporary illustrations by Joe Todd-Stanton with Alexandra Stewart's captivating writing and publishes in time to celebrate the centenary of Edmund Hillary's birth. 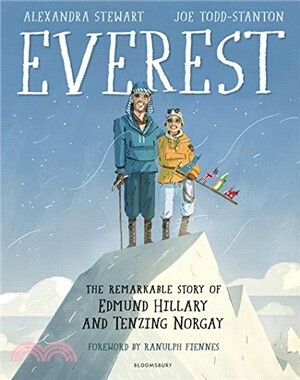 This unique narrative tells the story of how Edmund Hillary and Tenzing Norgay made their mark on the world from birth right up to their final days and the impact they've had on Nepal today.